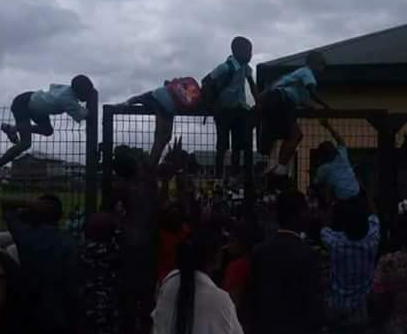 Earlier today, some parents in Rivers state stormed various schools to withdraw their wards after rumors made the rounds that some military officers were going from school to school to 'inject the students with the monkeypox virus'. The Nigerian Army has released a statement denying claims of carrying out vaccination in schools. 1. The attention of Headquarters 6 Division Nigerian Army has been drawn to some rumours making the rounds that some Nigerian Army Personnel are going round schools in Rivers State dressed in Military Camouflage uniforms with the intention of forcefully vaccinating students with an unknown substance. The callous and unpatriotic rumours spread by these enemies of State are, to say the least, despicable, deplorable and highly condemnable by all well meaning Nigerians as they are intended to cause pandemonium among the general public. 2. The authorities of 6 Division Nigerian Army wishes to inform the general public that while the Nigerian Army plans to undertake such gestures like free medical outreaches, sanitation exercises in host communities and distribution of educational materials as part of our community relations activities during the ongoing Operation CROCODILE SMILE II, these activities are yet to be conducted and will eventually be conducted with the consent of relevant authorities of designated communities and at venues and dates that will be duly communicated to the general public through future press releases and relevant posters. 3. For the purpose of emphasis, the Nigerian Army does not and will never carry out its medical outreaches or vaccination exercises for that matter in Schools. We can therefore categorically inform the public that the ongoing rumours about Nigerian Army Personnel going round schools in military camouflage to forcefully immunize school children are not true and should therefore be discountenanced with. Additionally, members of the public are please requested to call 09072509436-8 to report any case of any impostor(s) that may be seen actually trying to commit such atrocities. 4. You are kindly requested to disseminate this information to the general public through your medium. Thank you for your usual cooperation.